We're still getting nights down in the low 20s, but spring decided it had better start anyway. The buds on the peach trees are just barely starting to show pink, and I finally saw the first spring beauty flowers in the woods last weekend. Meanwhile, surprises are popping up around the yard. I tossed a bunch of red clover seeds in the gully last year after the briars got cleared away, but I assumed they'd bitten the dust since I never saw hide nor hair of the plants. 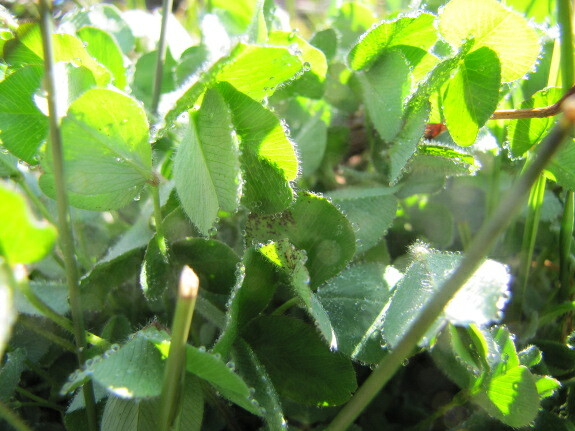 But while walking through the gully to get to the new dog door gate, I noticed several big clumps of clover coming up in the damp soil of the gully bottom. Maybe we'll do some soil building down there after all! Along the western fence, I'd planted three peonies Mom split from her own collection last summer. I kill mulched around them, but didn't give them much love, and the plants soon shriveled up and died. 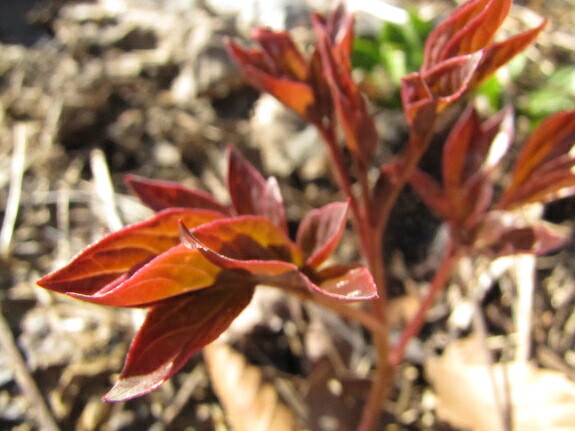 I let Mark start mowing over the peony patch in mid summer, but while walking past the mulched spot this spring, I saw shiny red leaves. Two of the three peony plants have come back from the dead --- happy zombie peony day! Don't you love spring surprises? 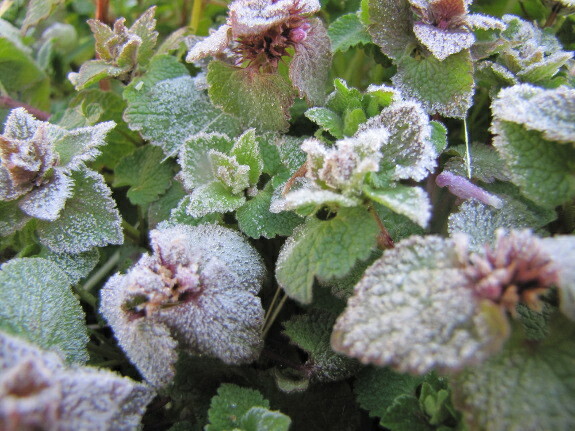 What popped up in your garden this year that you'd forgotten about or given up on? The Avian Aqua Miser keeps daily chicken chores to a minimum while providing fresh water for your flock. The fennal I planted is growing very well. I usually do not do well with fennal. It seems I must have not dug up ALL the potatoes last year. I now have a blueberry bush planted there with potatoes leaves popping up all around it. I walked out in the backyard yesterday and saw some flowers blooming on the ground that looked like plum blooms. I figured a bird broke them off and dropped them there but I tried to pick them up and realized it was on a 2 foot long branch (about 3/4" diameter) that was under the mulch I put down about 5 months ago. I pulled it up and to my surprise I found the base of the branch had begun callusing and trying to root. I will try to get some clear pictures this evening when I get home. Spring is always an amazing time of year with things that look dead coming to life. Below are some links to the branch I mentioned. I think Brian's spring surprise is my favorite. I'd love to have broken-off branches rooting in my mulch!! Leftover garlic from last summer! Strawberries where i was sure they were all dead! In the cold frame last fall i had tried a few cool weather things, but they werent really doing anything, so i just left them. Sooooo, after having no water since last october, or even snow melt ( inside the cold frame) and below zero temps with ground frozen solid, when i opened them up a few weeks ago, there are carrots, turnips, and lettuce growing like crazy! I wanted to ask also, what variety of open pollinated bell peppers are you growing? I am having a hard time finding seeds. I want red, green, and yellow. Deb --- We haven't tried all that many bell pepper varieties, but I've been happy with Tangerine Pimento. It works for us because the fruits are tasty and pretty and the plants bear very young (so we don't have to baby the seedlings inside for long). I mostly chose the variety on the speed-to-bear characteristic, though, so if that's less important to you, you might try some of the other options. One thing to keep in mind is that open-pollinated peppers will cross with each other. So, if you want three different varieties, you'd need to go to greater lengths to make sure they don't hybridize. Of course, green peppers are simply unripe peppers of other types, so you wouldn't really need three varieties to get your three colors, just two. Thanks, i will check that one out. ( and i plan to have a stern talk with all of them that they are not allowed to cross pollinate).